In this disorder, the delicate walls of the alveoli break down, reducing the gas-exchange area of the lungs. The condition develops slowly and is seldom a direct cause of death. However, the gradual loss of gas-exchange area forces the heart to pump ever-larger volumes of blood to the lungs in order to satisfy the body's needs. 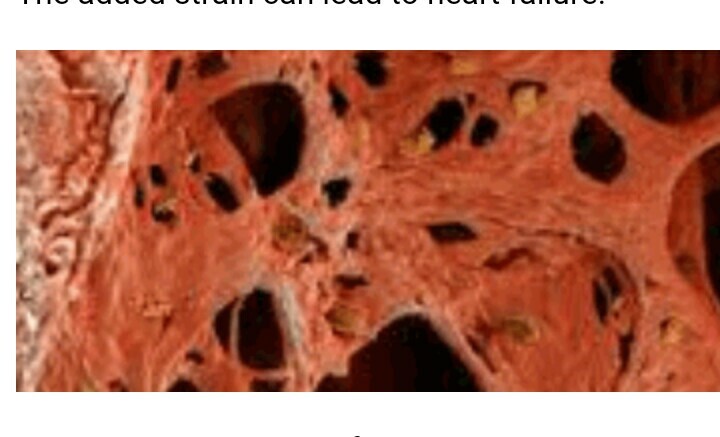 The added strain can lead to heart failure. The immediate cause of emphysema seems to be the release of proteolytic enzymes as part of the inflammatory process that follows irritation of the lungs. Most people avoid this kind of damage during infections, etc. by producing an enzyme inhibitor (a serpin) called alpha-1 antitrypsin. Those rare people who inherit two defective genes for alpha-1 antitrypsin are particularly susceptible to developing emphysema.